My lack of planning, favouring spontaneity, had worked well up until this point. 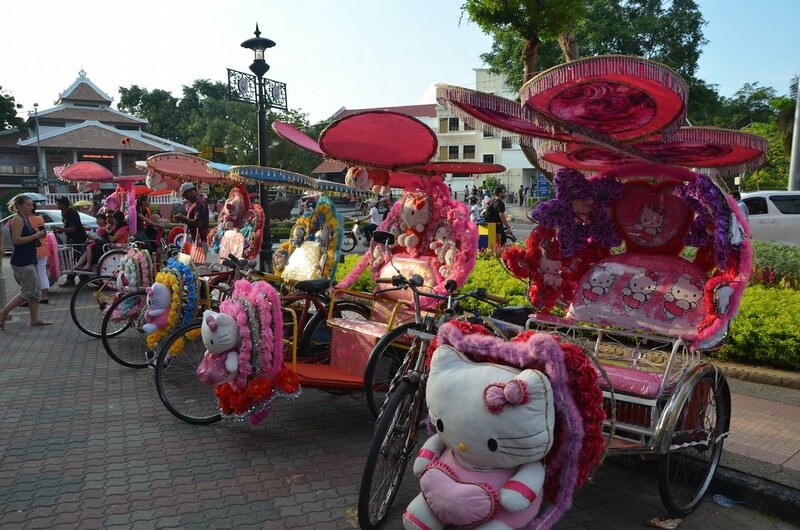 The existential crisis I now faced was my own fault, as my Lonely Planet had warned that you should book ahead for Melaka especially at weekends and, what do you know, I ended up with Melaka on my agenda exactly over the weekend. The hotels I had selected were available on Friday or Sunday but not Saturday, what a dilemma! After a whole lot of umming and ahhing I settled for the Friday night and then booked an extra two nights at a hotel in Singapore, where I was guaranteed to find something to keep me occupied. 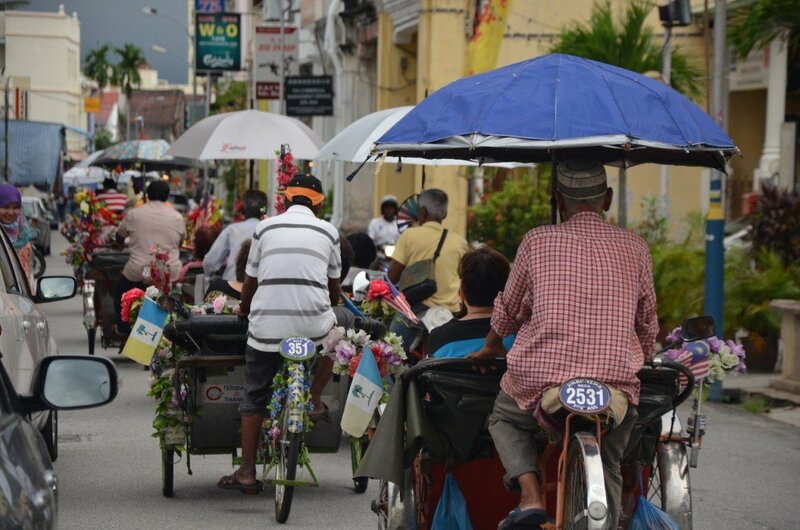 I faced similar problems when leaving Melaka, however, as the bus I had chosen, with a convenient pick-up directly at the hotel and arriving right in the city centre, was full – as were most of the others, and I desperately started researching trains and taxis to be able to continue my journey. Anyway, enough with the boring logistics – part of the adventure, isn’t it? 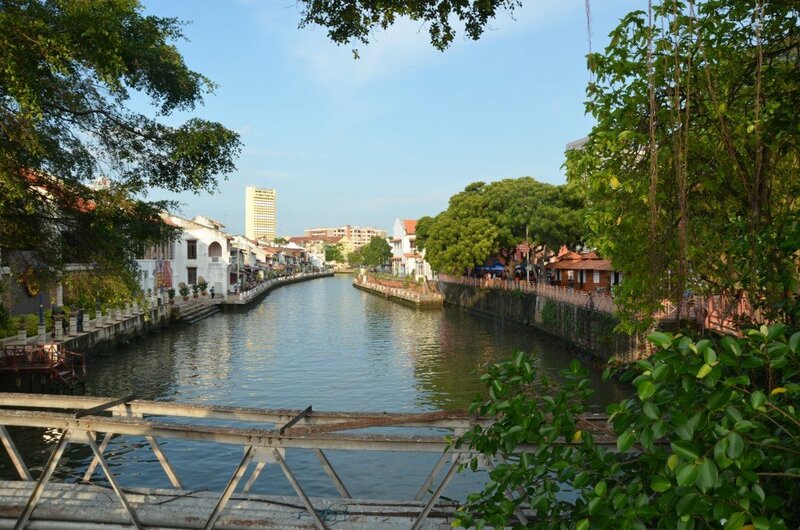 – and on to the historical city state of Melaka, or Malacca. Another UNESCO World Heritage Site, it’s crammed full of Dutch and Portuguese colonial shopfronts, antique shops and Chinese temples. 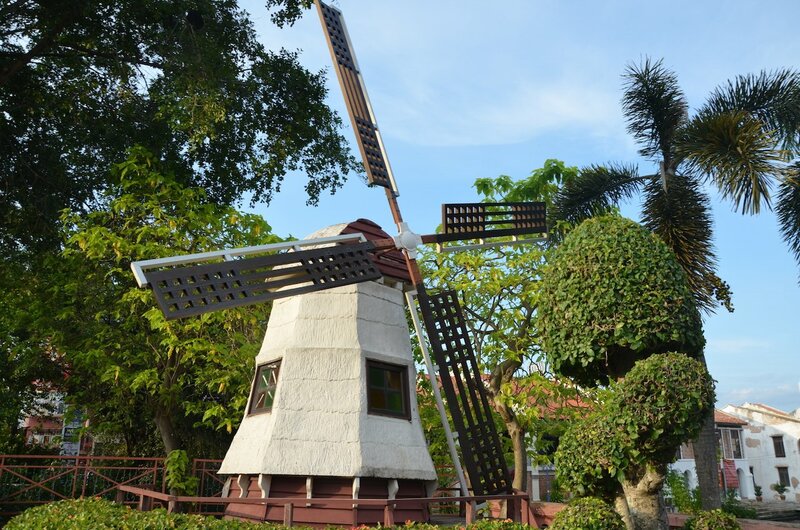 This odd sight stands next to Red Square where you’ll find the old Dutch Stathuys, a former administrative centre and possibly the oldest Dutch building in Asia, dating from the mid-17th century. Another odd sight in Red Square can be found in these not-so-subtle rickshaws, with “Let it go” blaring from the speakers and various Frozen paraphernalia on sale. 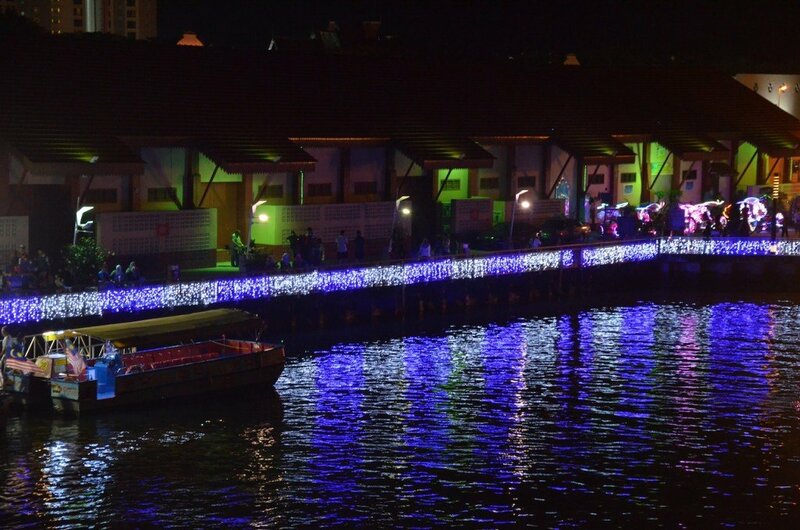 The river banks light up at night and you can take a 45-minute boat cruise from one end of town to the other. 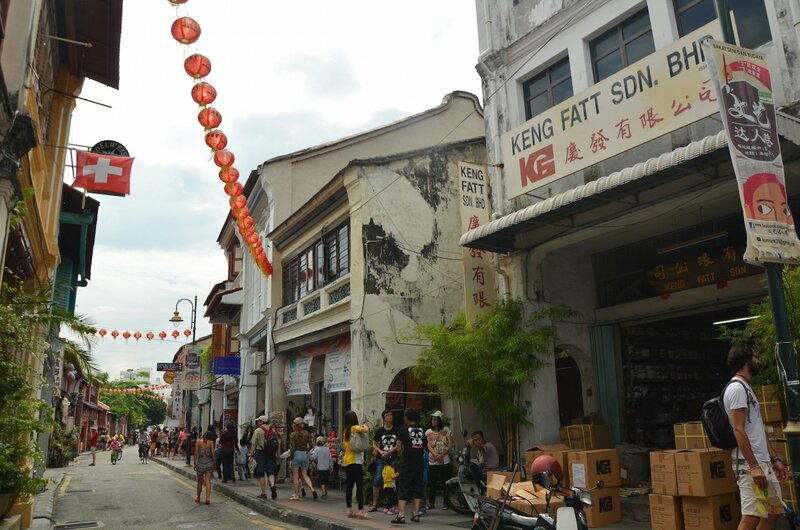 Jonker Street is the heart of Melaka tourism, known for its antique shops that can be found in houses from different periods of colonial rule: from the Portuguese (1511-1641) to the Dutch (1641-1798) to the British (1824-1946). “Jonker” comes from the Middle Dutch meaning “young lord”, and the street would have housed mainly traders and merchants. 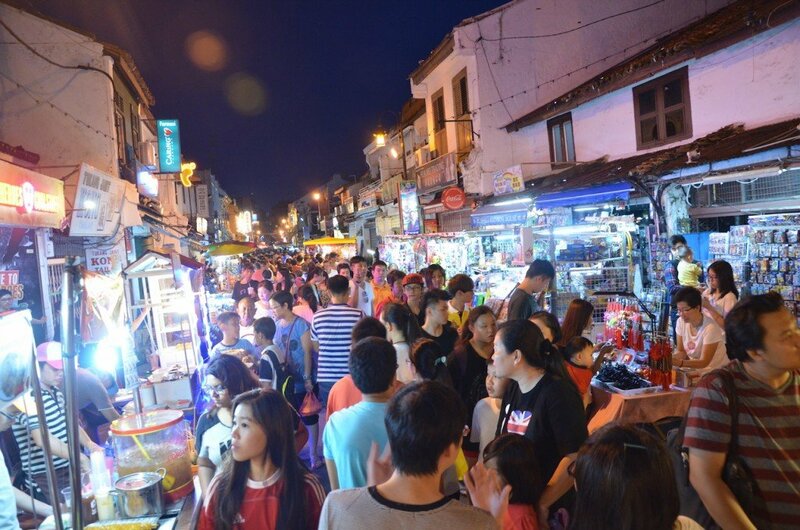 On Friday and Saturday nights, Jonker Street becomes pedestrian with stalls full of tat – mobile accessories, wallets and various other plastic trinkets, as well as Chinese delicacies – spilling out onto the road. I had over-estimated the amount of Malaysian ringgit I would need so now that I was heading into Singapore this gave me an excuse to spend the money on little gifts and souvenirs (NOT tat – there were also some nicer stalls and boutiques). 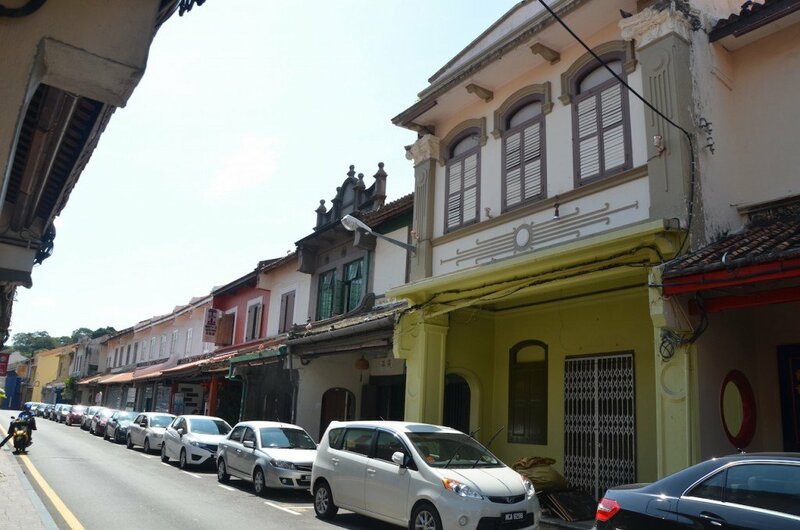 Heeren Street, Gentlemen’s Street or even “Millionaire’s Row”, remains a place for the upper classes of Melaka and once again has architecture from the Dutch, from the British, and from the more recent Chinese influences. The Baba & Nyonya House was home to four generations of the Chan family who came from southern China before it became a museum in 1985. ‘Baba’ (for men) and ‘Nyonya’ (for women) were terms initially used by Malays to differentiate these locally born Chinese from later immigrants. Early Chinese traders would often take Malay women of as wives or concubines and a fusion culture emerged. 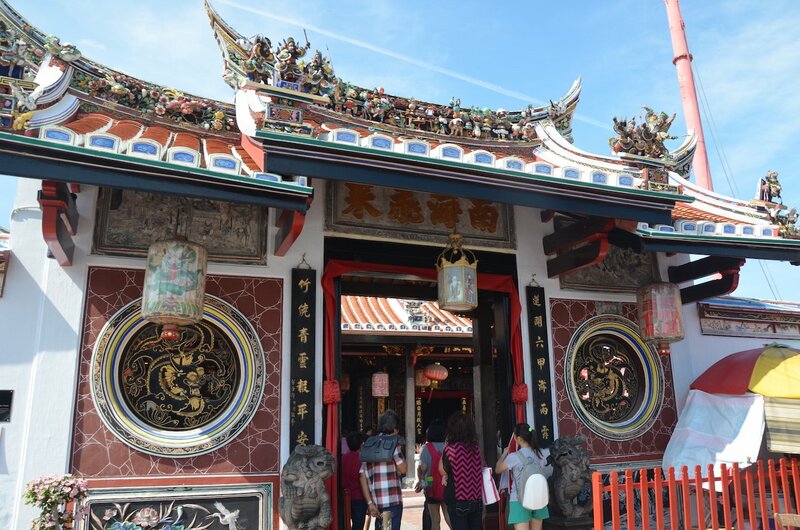 Cheng Hoon Teng Temple is Malaysia’s oldest Chinese temple, from 1646, built by migrant builders and craftsmen from China’s southern provinces. Melaka also has the country’s oldest mosque, Masjid Kampung Hulu, built in 1728. 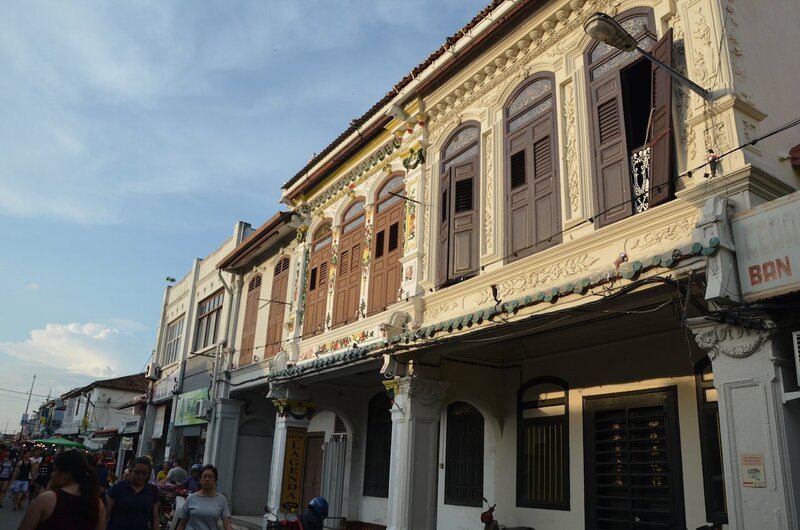 A fascinating mix of the old and the new, the antique and the modern, the authentic and the kitsch – but a day in the town of Melaka was plenty for me, and I was happy to move on to the last stop on this particular trip: Singapore. 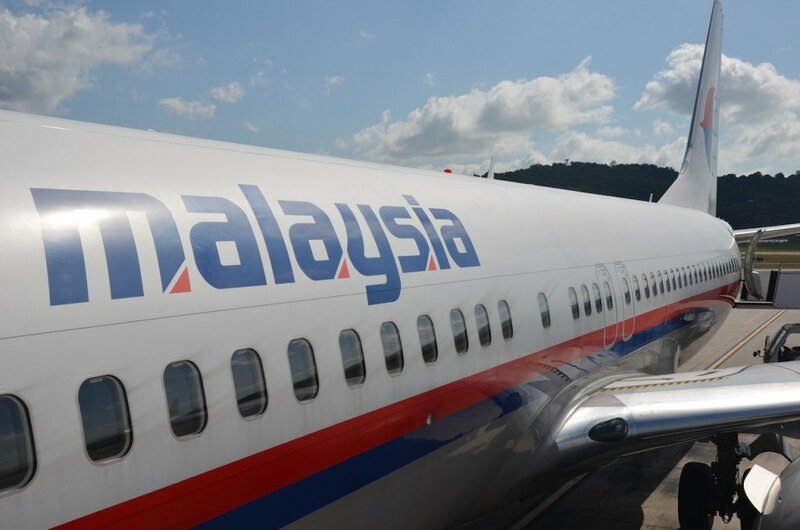 Flight Langkawi-Kuala Lumpur: I flew Malaysia Airlines for RM 150 including luggage, arriving in at KLIA. 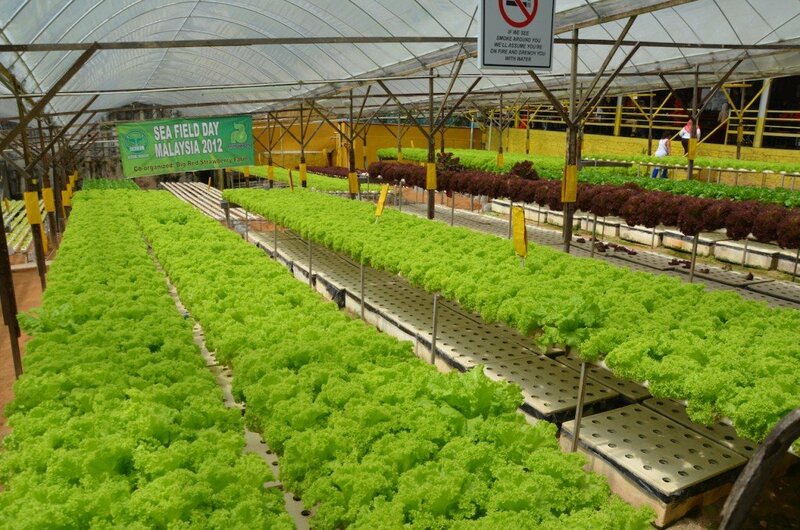 The airport is about an hour away from Kuala Lumpur city centre. Bus Kuala Lumpur-Melaka: I had researched a bus that would take me from Melaka directly from the airport, KLIA (instead of going into town first, which takes an hour, and taking a bus from there). I was pointed in the direction of a red company that left at 2pm but online I had seen that there was a bus leaving at 1pm. When I insisted, I was reluctantly taken over to the Transnacional bus, which left as planned just a few minutes later. The bus ticket was RM 25 and it stopped first at KLIA2 (15 minutes away), the budget airline terminal before continuing on to Melaka Sentral. From there, I took a taxi (voucher from the taxi counter) to my hotel for RM 20. Casa del Rio hotel: On arriving, I was ushered into a lounge area by the pool and received a welcome drink, a lime sorbet, with a lovely little “Welcome home Ms Lundberg” message. I also received a spa voucher for RM 50 but watch out: (a) it was full when I arrived, so book ahead during busy periods and (b) it doesn’t apply to the cheaper/shorter treatments. Bus Melaka Sentral-Singapore: After a brief delay where I wondered if the bus would turn up or not, we departed at 2.45pm; I eventually got off the bus in Singapore at 8.30pm. As we approached the border, the bus stopped first at Malaysian immigration where we got off leaving our bags on the bus. We went up to get our passports checked, through customs “nothing to declare” and then down an escalator to find our bus. Top tip: keep your eye out for distinctive-looking people from your bus and you can follow them (though this didn’t work for me, as I almost followed what turned out to be the wrong person onto the wrong bus). We spent quite some time in a traffic jam on the bridge and then reached Singapore immigration. This time we took our luggage off the bus, filled out a card, had our passports checked, bags x-rayed (“Liquor? Cigarettes? Okay. ), and found the bus again. Finally we were dropped in what seemed to be the middle of nowhere… I crossed the road to the Kampung V shopping mall, exchanged my leftover ringgit, and waited in line for a taxi to my hotel. I had big plans for Langkawi. I was going to go kayaking in the mangroves, ride a jet ski (on my bucket list), take the SkyCab cable car for a panorama of the area, visit the waterfalls, take a boat trip… I did none of these things. 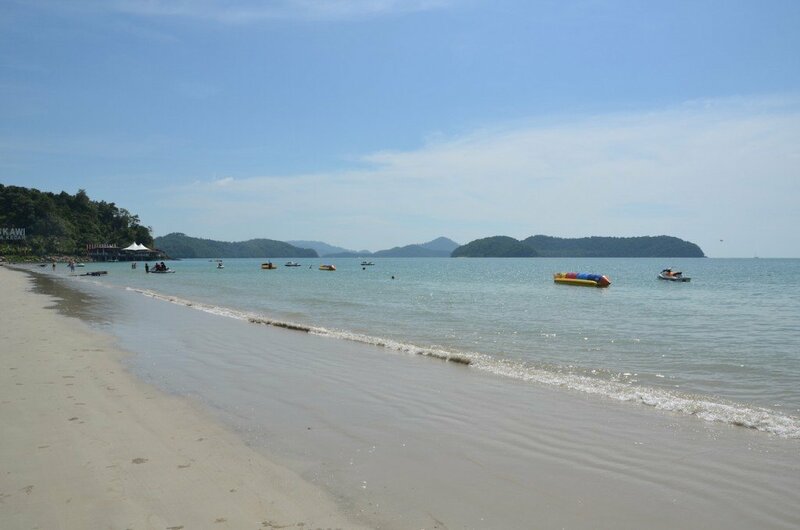 Langkawi is known as the Jewel of Kedah, Kedah being the state at the north end of Malaysia, bordering Thailand. It’s an archipelago but only two islands are inhabited, Pulau Tuba and the main island that I visited, Pulau Langkawi. I did a lot of research when choosing which of the beaches I would stay at: Pantai Cenang (gorgeous beach but busy and the most developed), Pantai Tengah (upscale, smaller beach), Pantai Kok (beautiful bay, but overdeveloped), Teluk Datai (beautiful and secluded but very expensive resorts), Tanjung Rhu (wide beach, upscale resorts). After all this research, I settled for Bon Ton Resort, named by my Lonely Planet as one of “our favourite places on Langkawi, if not in the region” with Trip Advisor also identifying it as one of the top resorts of the island. 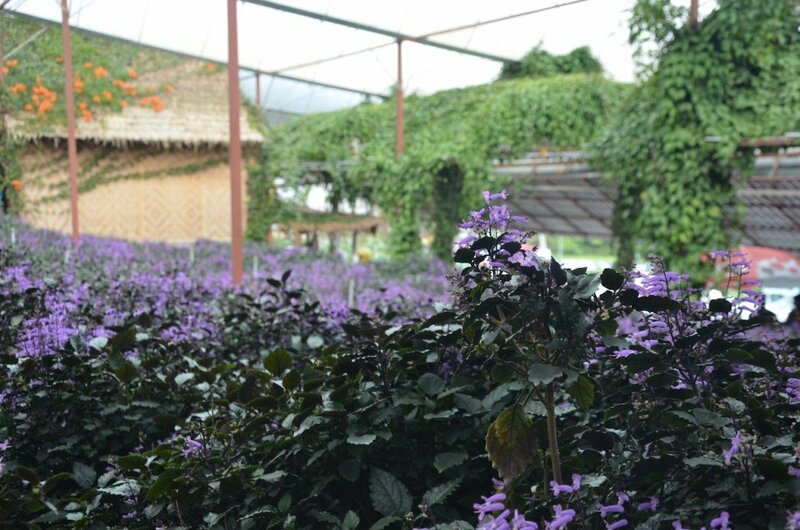 It’s luxury and rustic at the same time, with eight individual villas dotted about a green area by a lake; we had planes flying over us as we were right by the airport, and what I think were buffalos wandering past the restaurant every evening. Breakfast is put into your fridge the night before so that you can eat breakfast at your leisure – I kept the cake for an afternoon snack, yum. You also get a complimentary cocktail every day. Lovely. Another feature of the Bon Ton Resort was of a feline nature: the hotel is also a cat sanctuary. Now I’ve developed strong allergies to cats since having two fatties living with me for three years a while back, but the reviews on TripAdvisor assured me that people with allergies had no problems staying there. On arrival, as the friendly manager was telling me about the resort, I sat stroking one of the lovely little kitties, and then made my way to my cabin. Within hours, my hand was covered in big white welts, my eyes were welling up and I was sneezing non-stop. Suddenly the little monsters were everywhere. On the floor next to me, on the chair opposite me, on the sofa behind me, on the balcony, by the pool… it was like Hitchcock’s Birds but with cats instead. One of the staff kindly went to the pharmacy and got me tablets and eye drops, which I promptly over-dosed on. They also offered to move me into their sister resort, Temple Tree, where the cats were less prolific; after the first night, though, I was feeling much better so I stayed on at Bon Ton. I blame the quadruple dose of anti-histamine for my sleeping late and spending most of my time at the pool. It was great to have some relaxing down time instead of my usual sightseeing – in fact, on future trips I plan to schedule a few more beachy stops, also to make sure that I’m topping up my tan! My other big activity was a pedicure at the Satkara Spa attached to the Casa del Mar Hotel, much needed after all that walking in flip flops. 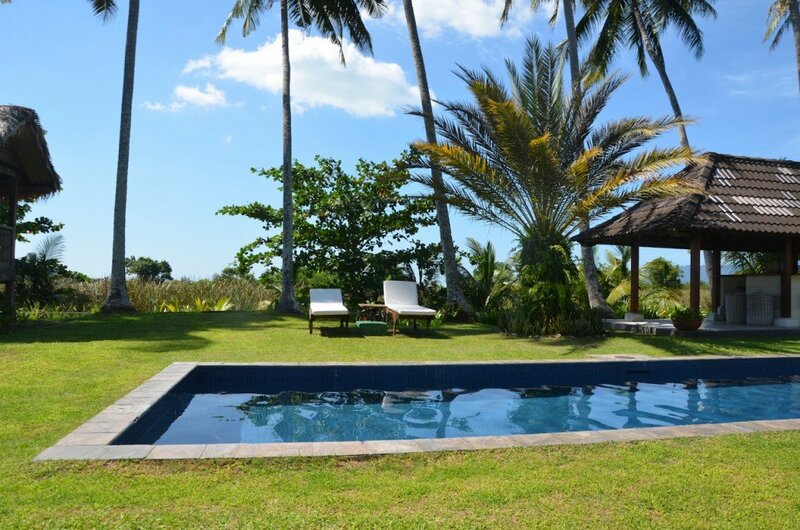 Bon Ton Resort: Bon Ton is about ten minutes from the airport, you can buy the voucher at arrivals and then the taxis are out in front. It’s a good half-hour walk from Pantai Cenang, the town and the beach itself, and it’s hot and a little with no pavement part of the way (I also got a few whistles as I walked alone, even during the daytime) – but you can rent a bike or a scooter to take you there and beyond. Bring earplugs if you’re a light sleeper or you’ll be struggling what with the dogs, the planes and various other neighbourly noises. Breakfast is bread with jam/honey, yoghurt, cake, juice – so if you’re allergic to gluten or on a low-carb diet you’ll need to tell them or buy your own. And, if you have cat allergies like me, I’m afraid I strongly advise you to choose a different resort…. I stayed in the Yellow Orchard cabin, one of the smaller ones. 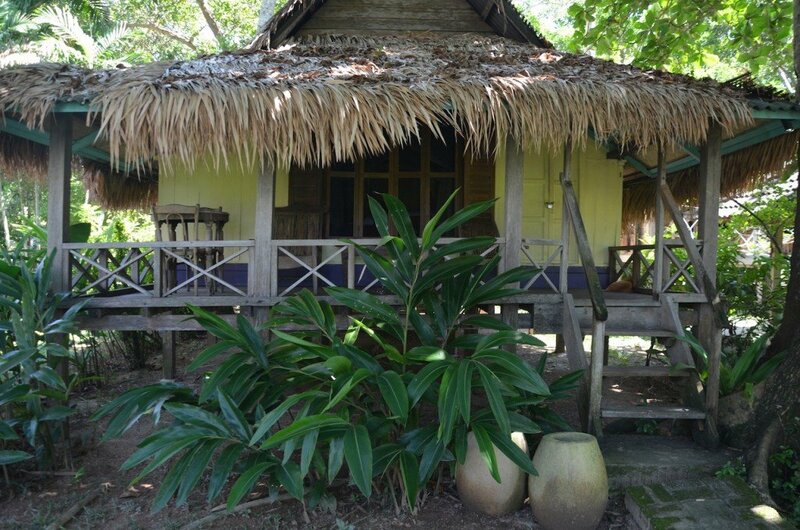 The cabins have an outdoor bathroom where you’ll find little lizards and various insects (my neighbour also found a dead bat inside her cabin – hit by the ceiling fan, the manager speculated). They give you a mosquito guerrilla kit (spray for you and for the room, two repellent plugs, and some balm in case you do get bitten) – I did get quite a few bites but I got even more in the big city of Singapore! I did venture out one day to walk into town and down by the beach. The beach didn’t feel too busy or noisy at all – but there were banana boats and jet skis and so on dotted all around so I can imagine that high season might transform the area into something less appealing. Since I had by now reached the northernmost part of Malaysia, it was time to double back and go south again (my flight home would be leaving from Singapore). Rather than taking the bus back the same way that I had come up, I booked a flight down to Kuala Lumpur and then continued on to Melaka by bus. 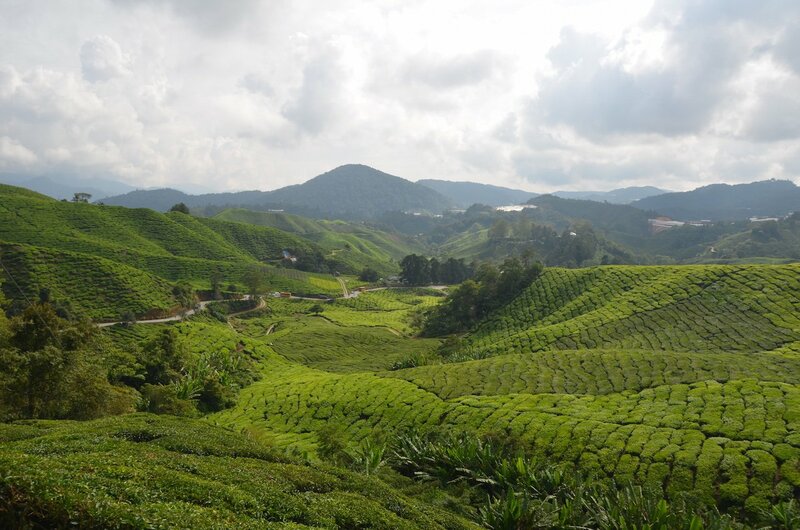 Domestic flights are very cheap in Malaysia and allow you to save time too. 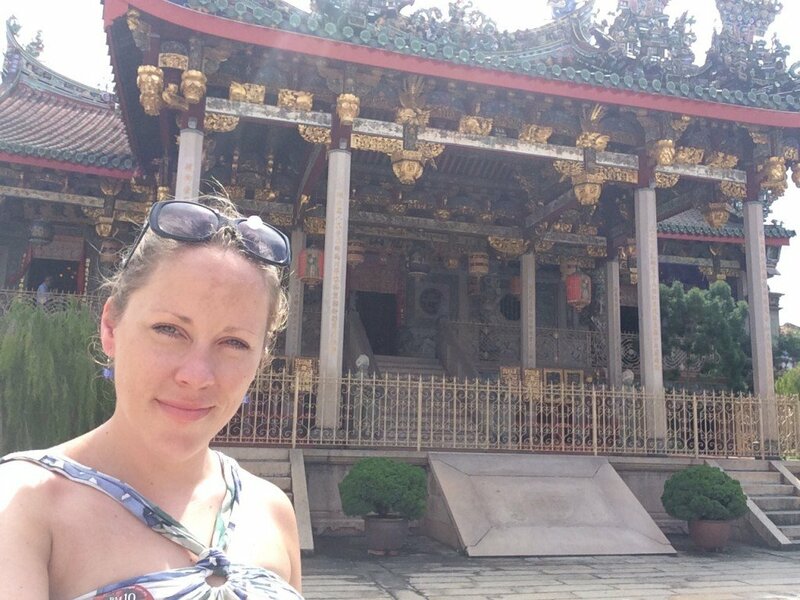 Two Days in Penang, Malaysia: Anyone for a curry? 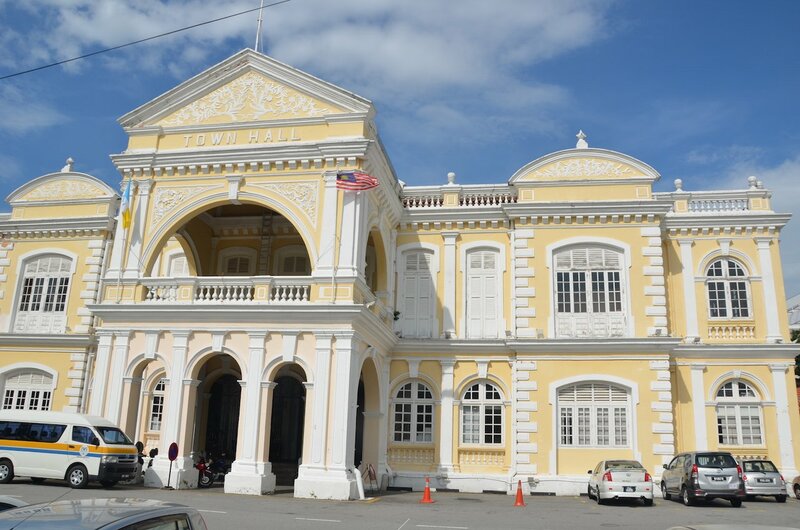 I arrived into Butterworth by bus from the Cameron Highlands and took the ferry across to George Town on the island of Penang, the ‘Pearl of the Orient’. 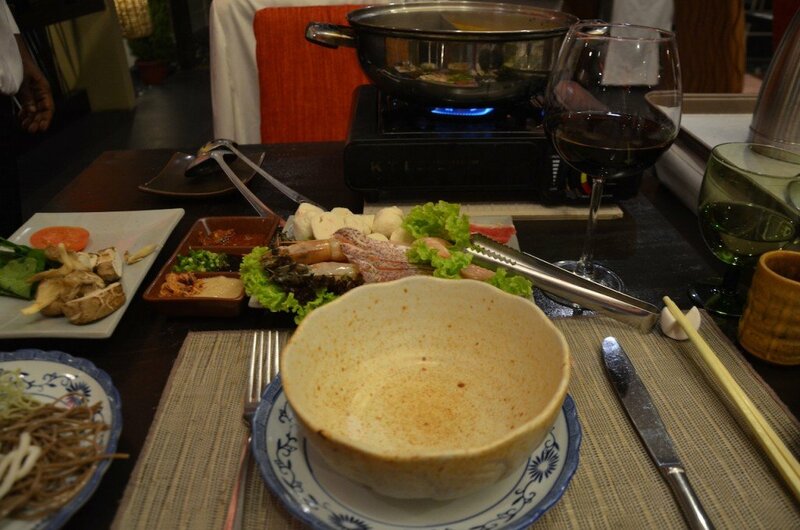 Penang, I had read, is famed for its food. Naturally, I assumed therefore that Penang curry must come from there and I was a bit surprised by my failure to find anyone serving this curry during my stay. It is only now that a little bit of research tells me that Penang (or Panang) curry actually comes from Thailand. Oops. The house itself was built in 1890-98, though the style is that of 300 years prior. The architecture is a merging of East and West, with Chinese symbols like that for ‘happiness’ placed at the main entrance but European-style iron grills, art nouveau stained glass and fake marble (the latter costing more, given the need to bring over European artists, than real marble would have cost). 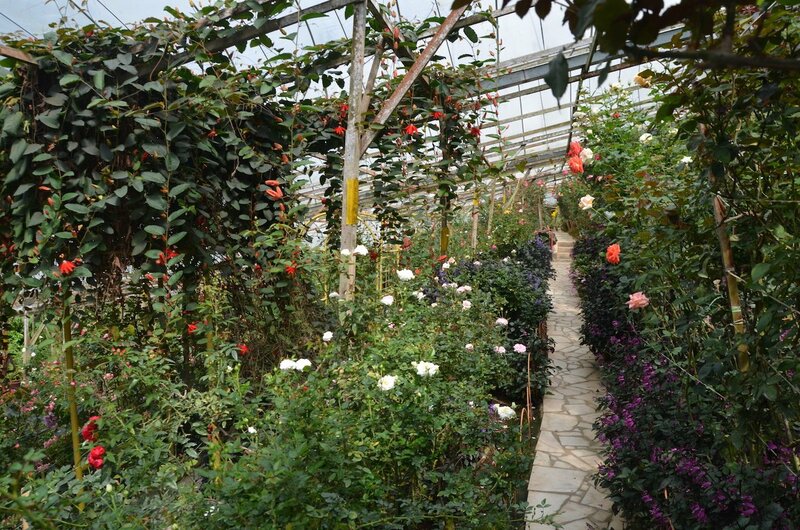 It is built according to basic feng shui principles, with water in front, a mountain at the back, and the house itself built on a slope (artificially constructed as there was no slope!). A clever copper pipe system on the roof and through the walls, with a drain in the main courtyard, means that the house has never had any problems despite flooding in the rest of the town. 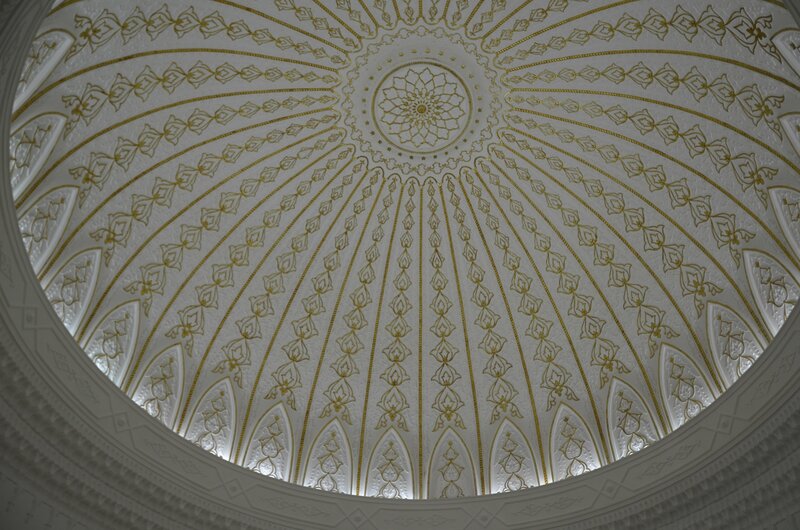 With 220 windows, a huge staff was required just to open and close the windows at night and when it rained. Cheong Fatt Tze was aged 74 when he had his last son, his wife (his seventh, and his favourite) 24. In his will he stipulated that the house could not be sold until this last son died, which he did in 1979. 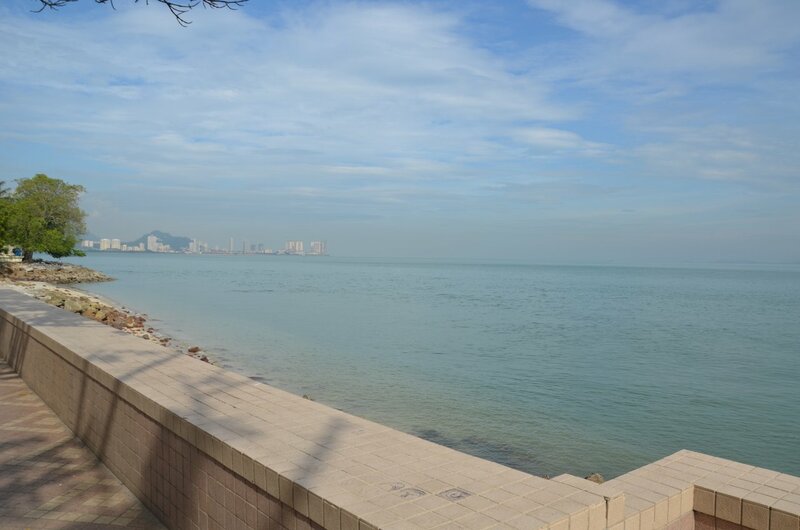 When the house was sold at auction in 1990, it was full of members of the Cheong family as well as 34 squatter families. There was a thick layer of dust on all the surfaces – according to our guide, no one felt obliged to do any cleaning since they didn’t own the house – and this preserved a lot of the materials over the years. 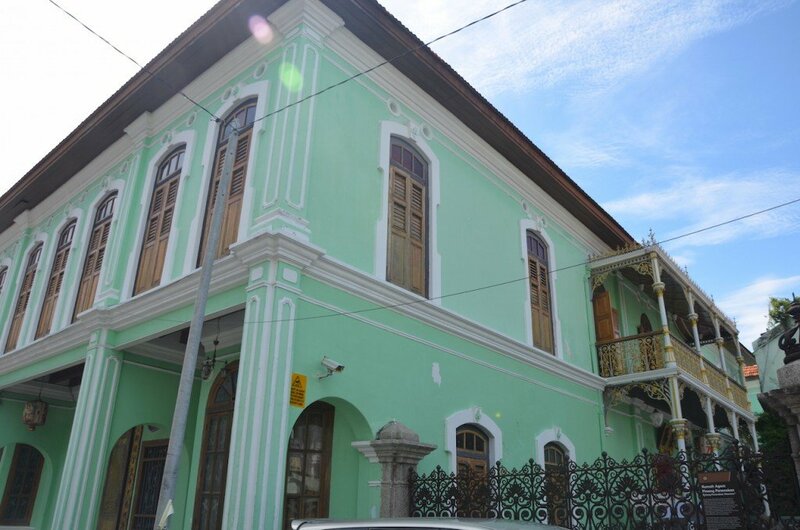 Today, the house is ‘unofficially’ a hotel – they don’t yet have a permit because of the wooden floors, which would need to be reinforced with concrete! 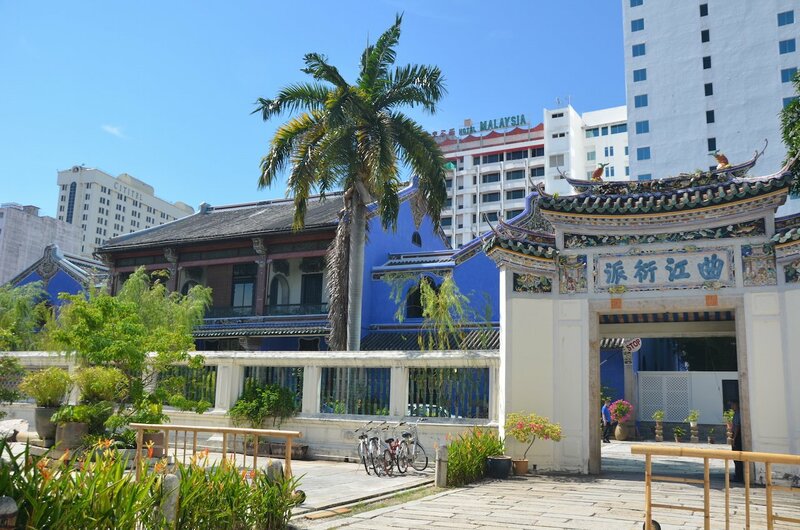 The Cheong Fatt Tze Mansion is also knowns as the Blue Mansion. Can you guess why? The weather in George Town was predictably unpredictable: each day, the skies would turn from clear blue to dark grey within minutes, and I learned to pack my umbrella as well as the fan that I bought at the Cheong Fatt Tze mansion. The following day, I started out on the Lonely Planet walking tour, passing the Supreme Court, the City Hall and the Town Hall. It was at this point that I became the subject of a photo series by an Indonesian family, who insisted on each getting photos standing next to me. Hmm. 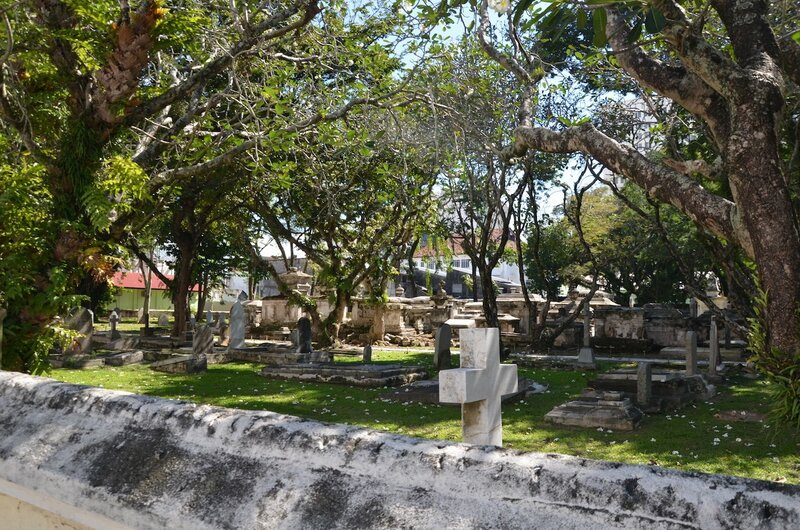 I continued my film tourism by visiting sites that feature in Anna and the King and, as a result, went round singing Getting to know you everywhere I went (wrong film: the musical version was The King and I with Yul Brenner; details, details)… The Protestant Cemetery is where the REAL Thomas Leonowens (Anna’s husband) is buried. Unfortunately it was closed off due to construction work so I couldn’t go in and find the actual grave. The Grand Ballroom of the Town Hall became the Royal Court Room in Anna and the King. Swettenham Pier became Bangkok Harbour in the film. I had intended to travel on the next morning to the island of Langkawi by ferry, and even bought the ticket. I was dissuaded, however, by my contact at my next hotel who said it was an ‘experience’ and the reviews on TripAdvisor which were mixed but overwhelmingly negative. I wasn’t so much worried about getting seasick as the fact that you had to stay indoors for the whole three-hour journey. Instead I bought an AirAsia ticket for a short flight of 25 minutes. Armenian Street was the setting of the Bangkok street scenes in Anna and the King, thanks to its already-very-convincing 19th century merchant houses. 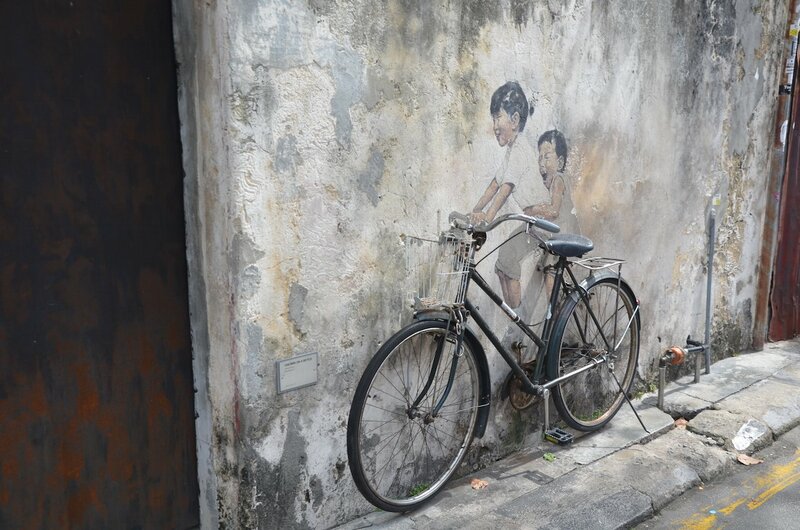 Armenian Street today also draws a crowd thanks to its street art created by Lithuanian-born Ernest Zacharevic. 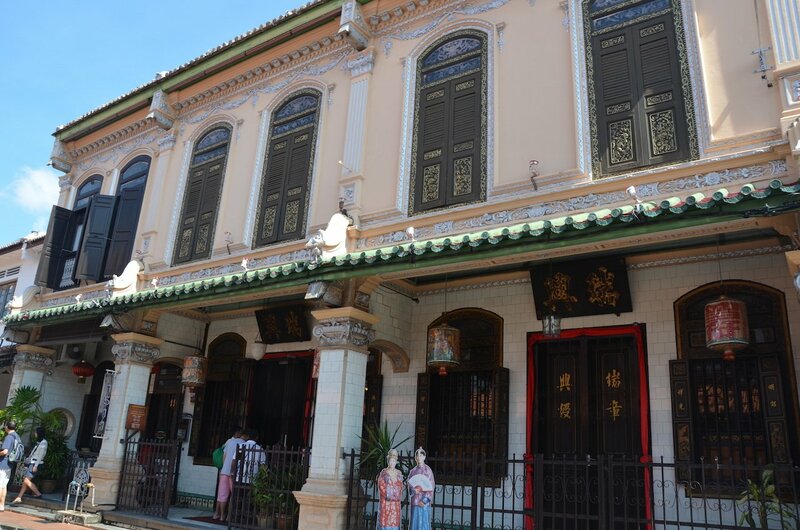 The area around Armenian Street houses many of the town’s clan houses, built to honour the ancestral spirits. 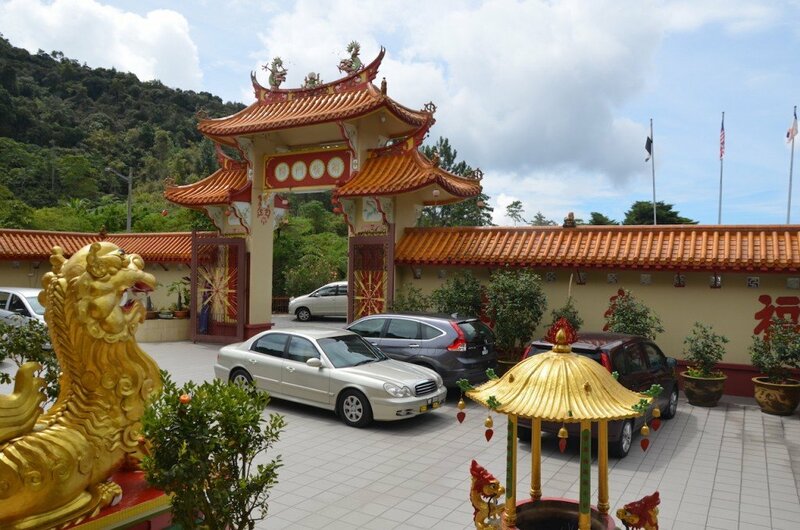 The Khoo Kongsi clan complex was like a little village for the Khoo family, who were wealthy Straits traders. This is the temple, built in 1906; in the film Anna and the King, it is where Tuptim was captured by the Palace Guards. 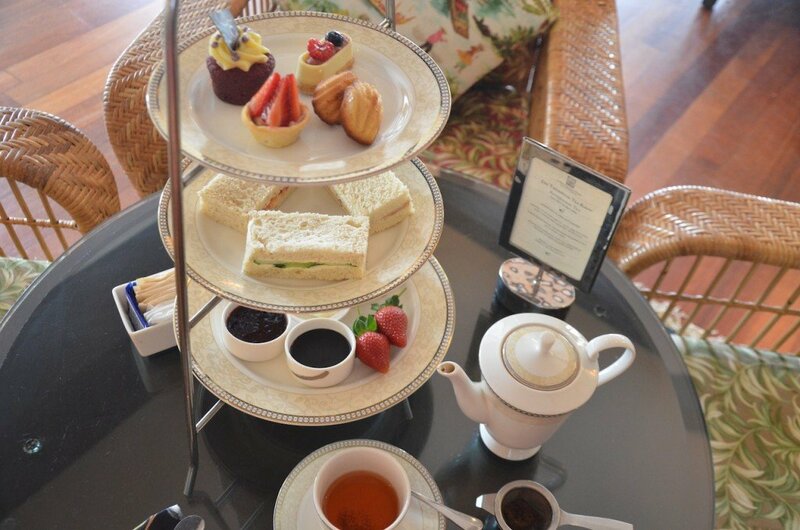 Hotel in Penang: I had contacted the Muntri Mews Boutique Hotel for a single room but it was full so they gave me a family suite at the newer Muntri Mews Residence for the same price. Very nice, with great service including shutters being opened and closed and fans and air con being turned on and off in the mornings and evenings, and with breakfast served at the café across the road. 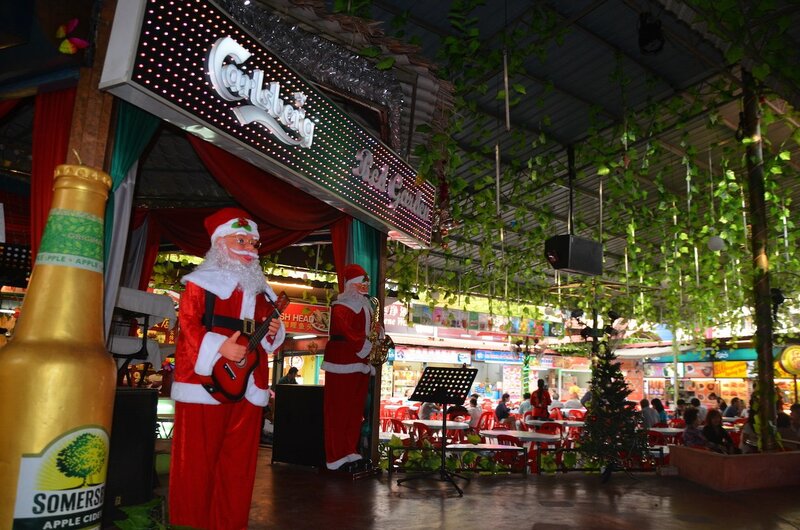 Flights are operated by AirAsia and Firefly, the latter a subsidiary of Malaysia Airlines. My single ticket including luggage and seat reservation with AirAsia was RM 189 (without the extras it would have been RM 111). 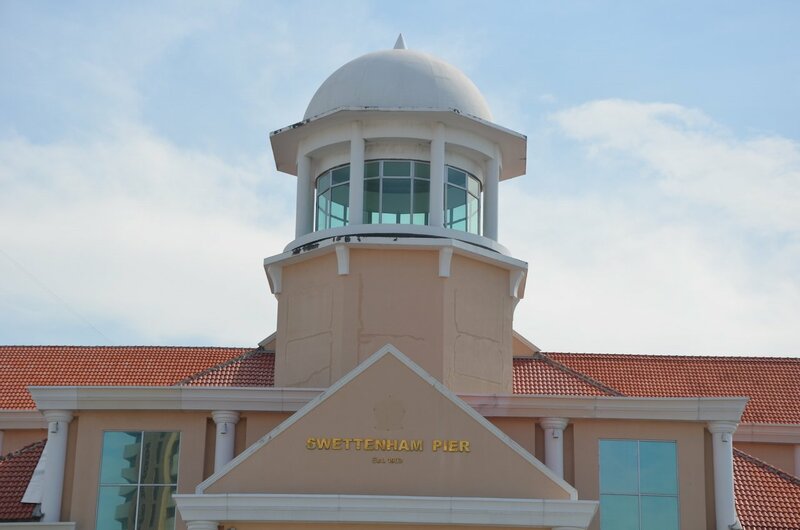 If you want to brave the ferry, you should get the ticket in advance from one of the kiosks outside Swettenham Pier for RM 66.50. 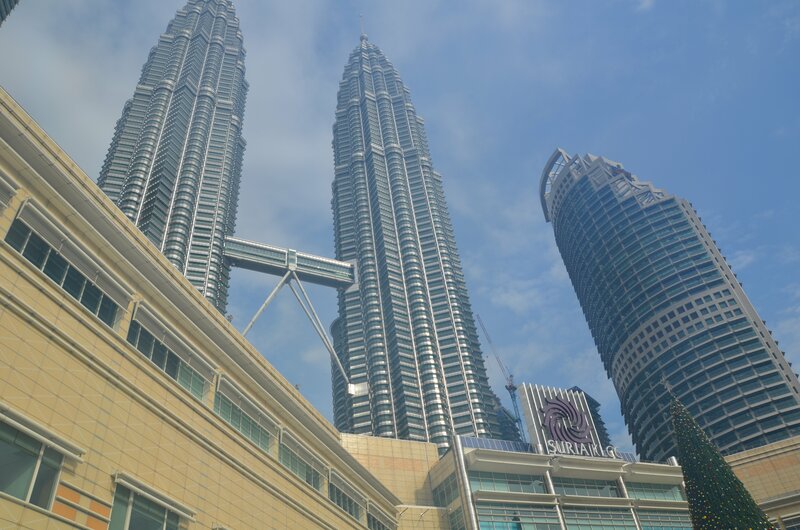 I booked Malaysia a little bit on a whim: I needed a new country that was ‘on the way’ back from New Zealand and Australia, and I looked for the cheapest flight combination. 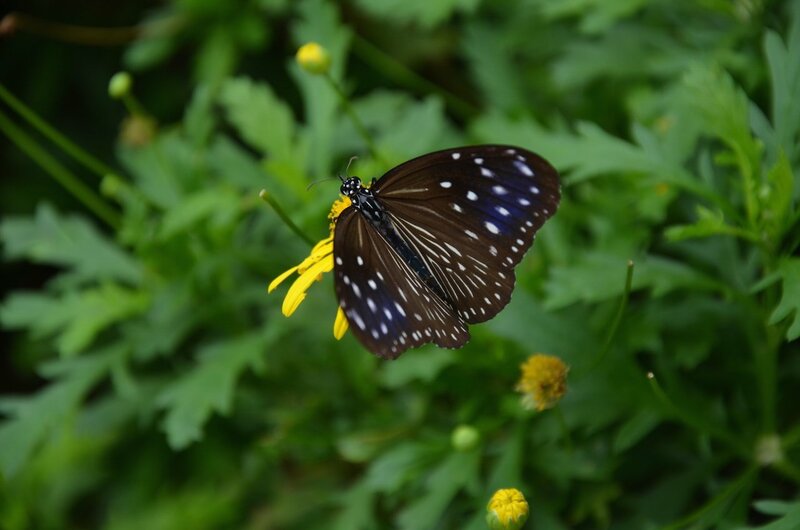 I’ll also admit that as the time drew nearer, I started to feel a little reluctant to leave behind the comfort and familiarity of those countries, where I had also been with friends, to fly on my own to Asia where as far as I could see on my weather app there was a tropical storm brewing. Silly billy. 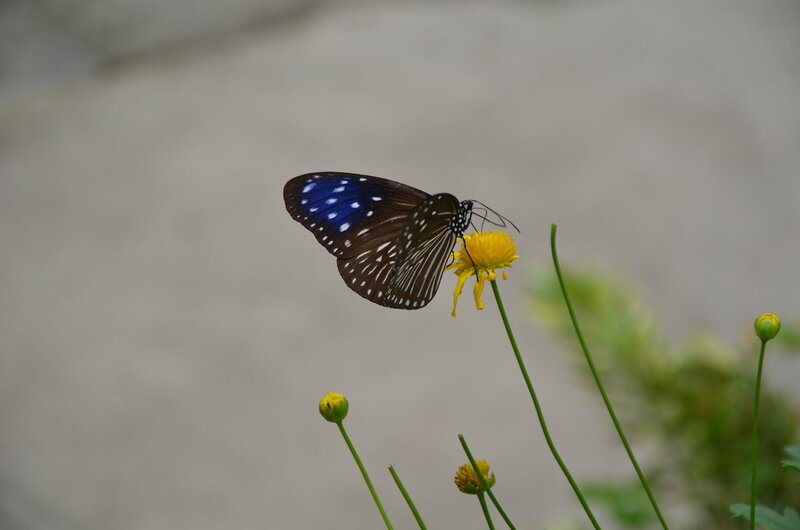 I had a fabulous time during my ten days in Malaysia, and I’m so glad I went there. 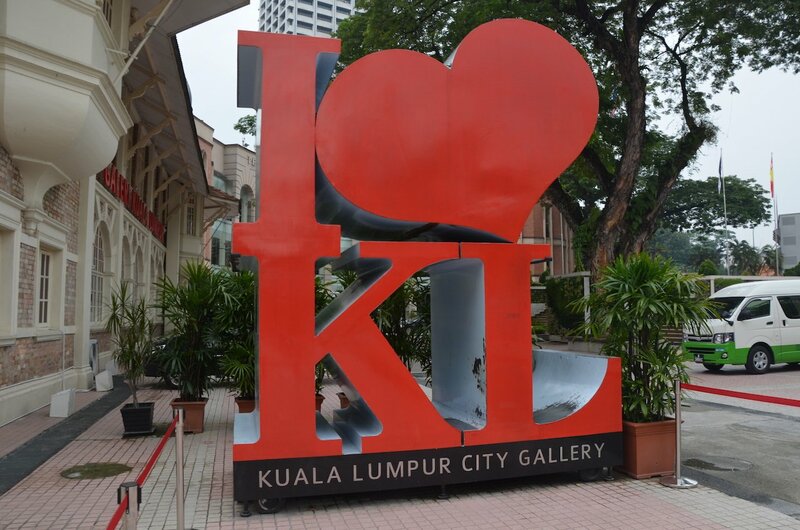 First up, the capital city, Kuala Lumpur. 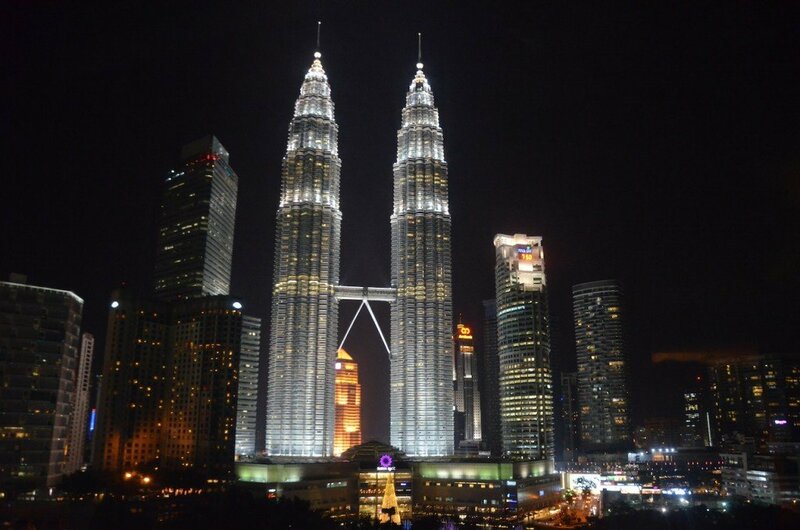 The Petronas Towers were the tallest buildings in the world from 1998 to 2004 when Taipei 101 was completed. 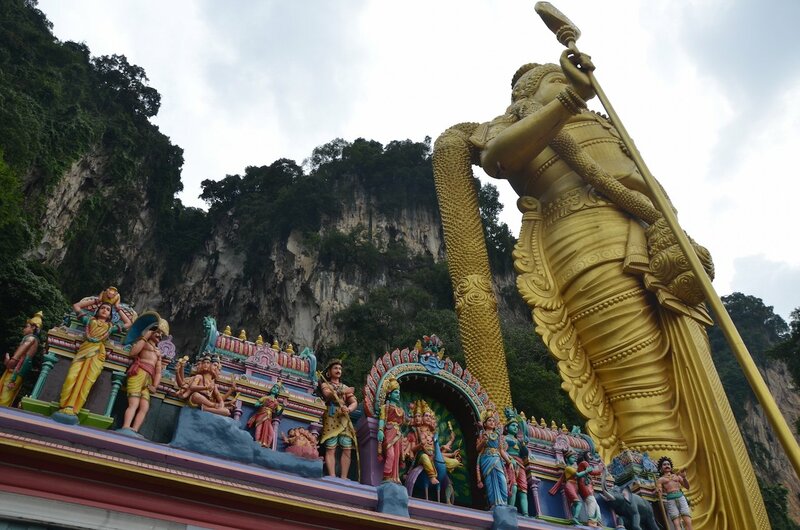 I did eventually venture out of the hotel, however, and my first excursion was to take the train out to the Batu Caves in Selangor. Coincidentally I ended up in what turned out to be the Ladies’ Coach, intended to off women some privacy – I was surprised to see a man there but, indeed, a guard soon appeared and told him to leave. 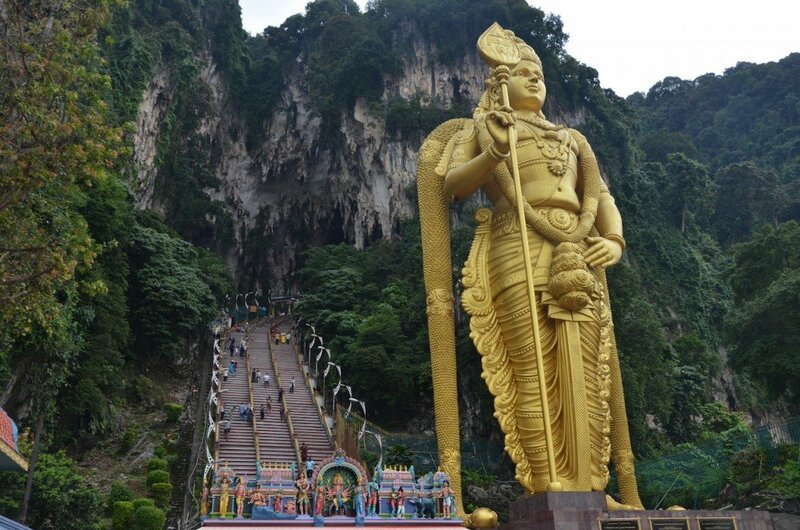 The Batu Caves make up a shrine to the Hindu god of war. Halfway up to the main temple at the top is the Dark Cave, where you can go caving with an organised tour. The gold statue is more than 40 metres high, constructed of concrete and steel covered by gold paint. 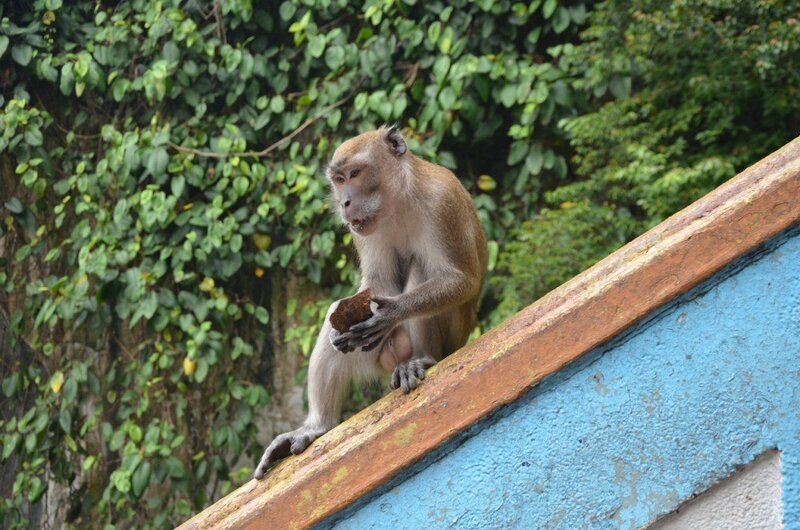 I’d been warned about the macaque monkeys and told not to bring any food. I was feeling pretty confident having just taken this lovely photo of one of them munching peacefully on a piece of coconut, when suddenly I became aware of one of his friends who had attached himself to my bag. As he bared his teeth at me, all I could think of was the fact that I had neglected to get my rabies vaccination top-up before my trip. 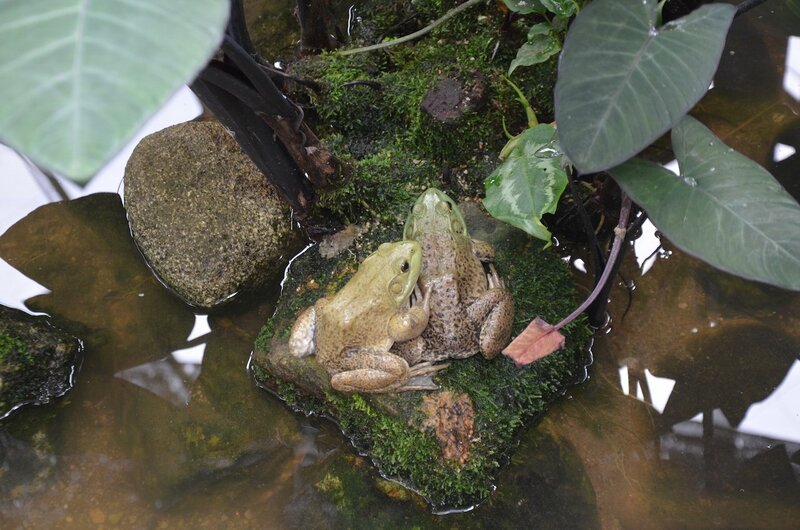 I’m still embarrassed to admit that I hit the poor guy with my Nikon D5100 to get him off me. I avoided eye contact with the people around me as I made my way back down to the bottom of the staircase; I’m pretty sure that hitting a monkey on the steps of a Hindu palace is bad for my karma. I retreated to some culture that was not overrun by macaque monkeys, visiting the Islamic Arts Museum where displays included religious scrolls, architecture, and jewellery as well as a temporary exhibition of modern art from Turkey. The building itself was quite impressive too. 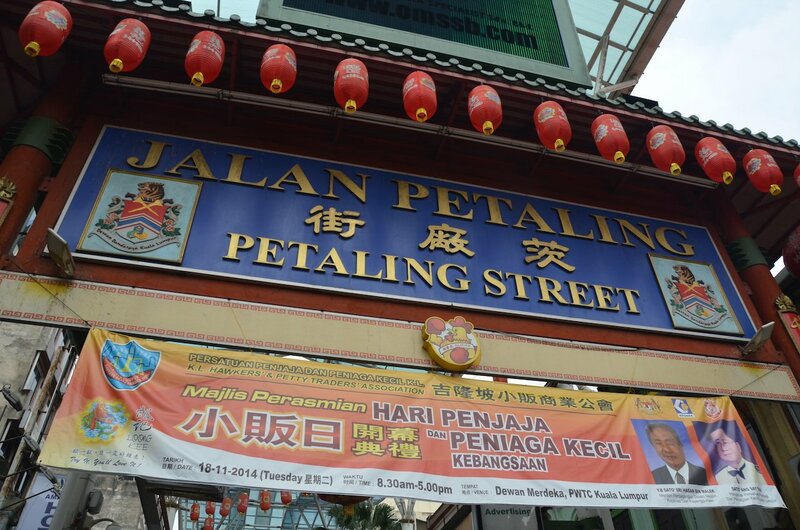 Jalan Petaling, Petaling Street, is the heart of Chinatown. Here you can buy all sorts of fake designer gear and other tat. 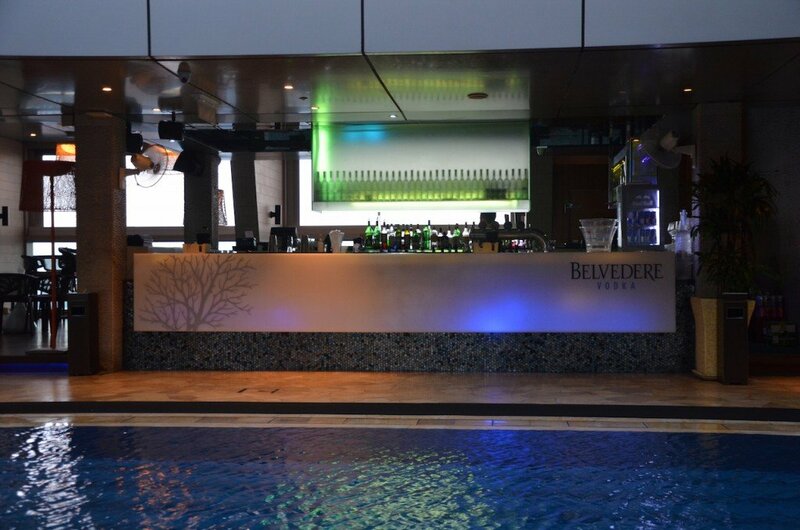 The main point of Traders Hotel, apart from the views of the Petronas Towers, is its famous Sky Bar by the pool on the top floor. I indulged in a lychee rose cocktail followed by a kiwitini while enjoying those views. 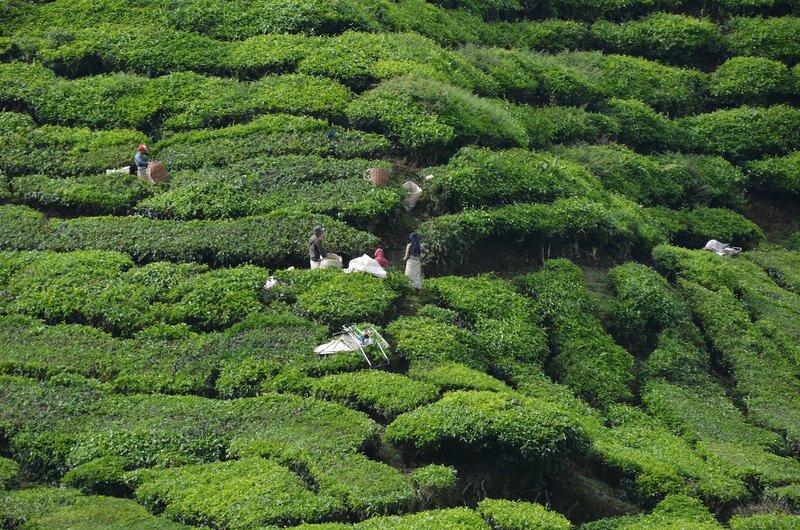 After two nights in Kuala Lumpur, I decided to journey on into the Cameron Highlands where I was promised cooler temperatures and both tea and strawberry plantations. The bus system was similar to the one I had experienced in South America, with different companies operating out of the terminal and a very flexible system where you can just turn up and be on your way ten minutes later. The bus was comfortable, with seat belts and air conditioning, and I got a seat right at the front (in fact, there was a man with a huge neck wound sitting in my seat but I decided not to force the issue). A sign reassuringly declared, “Plastic bag is for vomit purpose only, not for rubbish.” Wonderful. Getting into town: The city centre is a good hour away from the airport. Once you’ve picked up your luggage, there’s a taxi counter where you can buy a coupon that you give to the official taxis that are waiting out in front. Taxi touts are illegal and the coupon system ensures that you get a safe driver and a fair price. It cost me 75 ringgit. Traders Hotel: While I didn’t particularly enjoy the business feel of the hotel itself, my view of the Petronas Towers was impressive and the bar on the top floor wasn’t too shabby either. There was a buggy driving back and forth between the hotel and the KLCC in case you couldn’t walk those few metres in the heat, and the concierge was incredibly friendly and informative. Tip for the Sky Bar: arrive early and you’ll get a great table – as I was leaving, all the other tables were full or reserved. 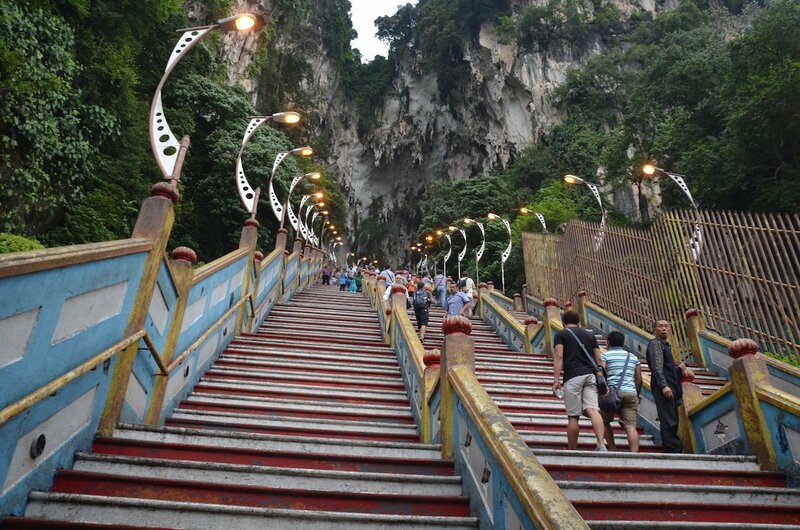 Batu Caves: I took the Kelana Jaya (red) line from KLCC to KL Sentral for 1.60 ringgit and then changed to the KTM Commuter train from there on to the Batu Caves at 4 ringgit for a return ticket. 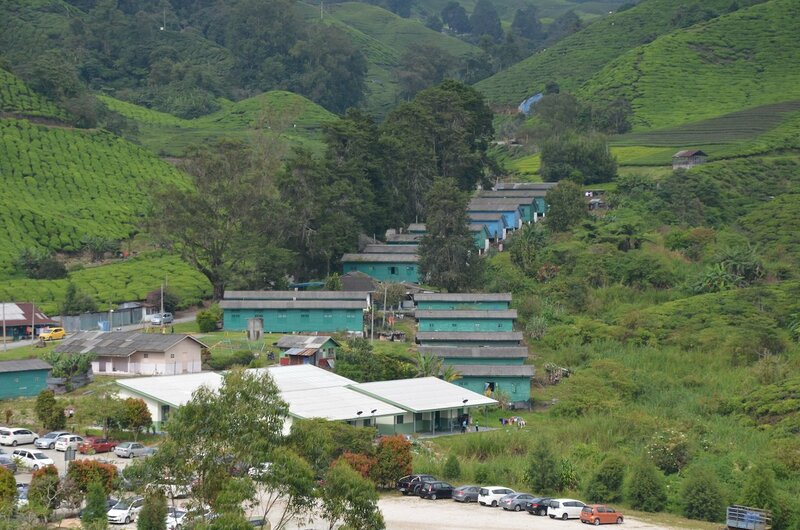 Bus to Cameron Highlands: The bus left from Puduraya bus station; the taxi from Traders Hotel cost 14 ringgit. One adult ticket was 35 ringgit. Ignore all the touts on your way up to the third floor where you will find the ticket counters for the various bus companies.